With so much new snow and wind, today has dangerous avalanche conditions. The avalanche danger is HIGH at upper elevations where the combination of new snow, wind drifted snow, and buried weak layers will produce avalanches. With snow falling today and continued strong winds, some avalanches may happen naturally. Avoid being on or underneath avalanche terrain which is any slope steeper than 30 degrees. The avalanche danger is CONSIDERABLE at mid elevations which are experiencing strong winds as well. Avalanches are still possible at low elevations where the danger is MODERATE. FOR THE WASATCH, WESTERN UINTA, AND BEAR RIVER MOUNTAINS. THE AVALANCHE DANGER IS HIGH TODAY. HEAVY SNOW AND STRONG WIND IS CREATING WIDESPREAD AREAS OF UNSTABLE SNOW AT UPPER ELEVATIONS. HUMAN TRIGGERED AND NATURAL AVALANCHES ARE LIKELY. STAY OFF OF AND OUT FROM UNDER SLOPES STEEPER THAN 30 DEGREES. TRAVELING IN AVALANCHE TERRAIN IS NOT RECOMMENDED. Check out the latest podcast - The Risks and Rewards of Ski Patrol - A Conversation with Jake Hutchinson. There's simply too much water weight, too much wind and too much uncertainty. Since yesterday morning, the Provo area mountains have received about 3-8 inches of snow (0.4-0.8 inches of water). A lot of the new snow has been graupel snow which are little pellets of dense snow. Total snowfall since Saturday evening is about 20 inches of snow containing 3.8 inches of water. Temperatures this morning range from the upper 20's F to lower 20's F. Winds from the S and SW are blowing steady 25-30 mph and gusting 40-50 mph. These winds reaching down into the trees and places typically more sheltered from wind. Upper elevations are likely experiencing gusts of 70-80 mph. Today snow and strong winds will continue with another 4-8 inches of snow. Temperatures may warm up by about 5 degrees or so. Tonight winds will shift to the NW and bring more snow and much colder temperatures. 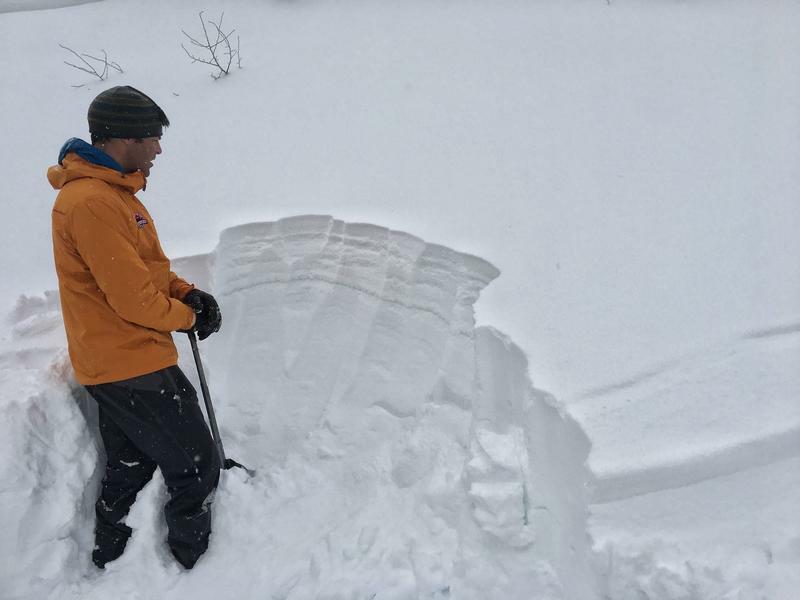 A significant natural avalanche was spotted on Timpanogos in the backcountry near Sundance. It was 3-8 feet deep and 500 feet wide (no photo). Other similar slides may have occurred. 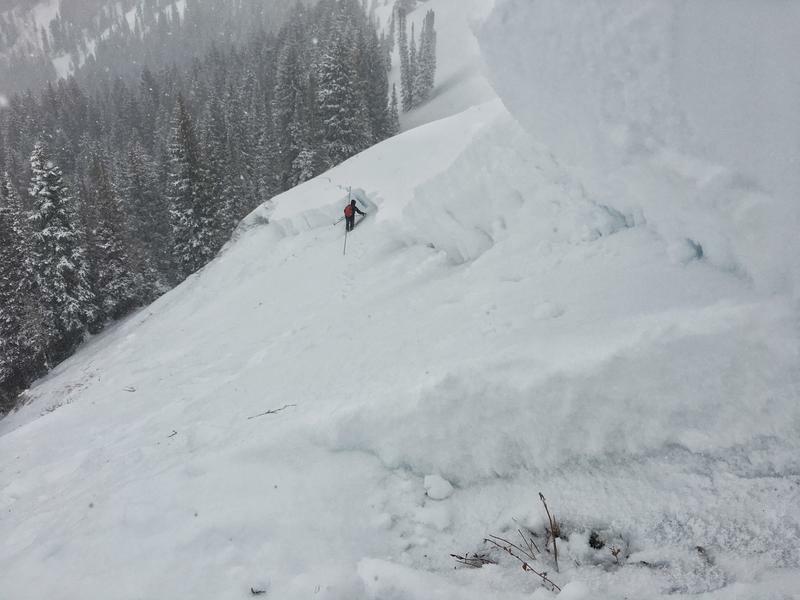 Ski patrols triggered many slab avalanches involving the new snow and wind drifted snow. Southerly winds were transporting a lot of snow yesterday and continued through the night. Fresh slabs of wind drifted snow should be easy to trigger today as more snow falls and winds continue blowing from the south and southwest. What surprised me the most yesterday was how winds were reaching into many areas typically sheltered from the wind. There are few slopes untouched by winds. Today I would be looking for fresh wind drifts on most aspects and elevations and avoiding them. There are two persistent weak layers to worry about. One is weak snow near the ground. This layer is most likely to produce an avalanche in places that have avalanched previously this winter (repeater paths). Drew and I unintentionally found one of these slopes yesterday when we were descending a ridge on Little Water Peak. The cornice broke and triggered a large avalanche at the ground. The only way to avoid this problem for now is to avoid riding avalanche terrain generally on the northern half of the compass including some upper elevation SE facing slopes. While many slopes have a deeper and stronger snowpack, everything has its breaking point. I'm not sure if this snowfall has pushed slopes with a deep and strong snowpack to their breaking point or not yet, but I wouldn't want to find out. It's best to be a little patient. The second layer is the the snow surface from Saturday that has a combination of small, near surface facets and surface hoar that are now buried 1-3 feet deep by the new snow. This layer will make slab avalanches involving the new snow and wind drifted snow easier to trigger and more sensitive. In many places this layer is easy to spot in snowpit wall as seen below. You can see all the layers in the new snow and the bottom stripe is the weak, faceted layer. If you avoid wind drifted snow and stay off the aspects shown above for slopes that may have a buried persistent weak layer, then the avalanche problem to watch for is simply the new snow. It's always hard to know if it will fracture as a slab. The good new is that you can observe how the new snow is reacting on small test slopes. With snow continuing to fall today, I would expect the new snow to at least produce loose sluffs, but it may produce soft slabs about 1-2 feet deep. This information does not apply to developed ski areas or highways where avalanche control is normally done. This forecast is from the U.S.D.A. Forest Service, which is solely responsible for its content. This forecast describes general avalanche conditions and local variations always occur.